Zaracon Boxers, reg'd is very happy about the litter between Sawyer and Lazer. Both are health tested for: hips, thyroid, and heart. Sawyer has also had her eyes tested. 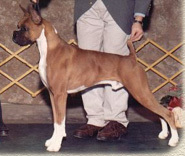 Sawyer is a multiple group winner in Canada under limited showing. 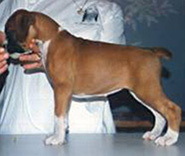 Lazer is an American Boxer Club award of merit winner and Top Twenty competitor. This litter was born on 07 October 2002. 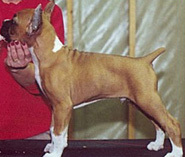 The breeding was the result of artificial insemination via surgical implant. Two fawn males were produced and later placed in fantastic devoted homes. Scroll to see the puppy pictures on this page or check out the page for Briar and the page for Bogey. Group puppy photos (the fun-side of it all) . . . Boys at birth. Boys at one week. Boys on their first outing. Boys after eating a big meal. Bogey stretching out. Bogey sleeping with toy turtle. Bogey trying to move. Bogey with Sawyer. Briar stretching out. Briar snug as a bug. Briar on the move. Briar talking to us. Individual puppy photos (the serious-side of it all) . . .
Bogey puppy profile. Bogey puppy headpiece. Bogey with ears taped. Bogey stacked at eight weeks. Briar puppy profile. Briar puppy headpiece. Briar with ears taped. Briar stacked at nine weeks.